On Monday 9 March 2011, Professor Salim Al-Hassani, Chairman of the Foundation for Science, Technology and Civilisation (FSTC), was the guest of Newcastle University where he delivered a lecture on ‘'Muslim Heritage and the Cultural Roots of Science'. On Monday 9 March 2011, Professor Salim Al-Hassani, Chairman of the Foundation for Science, Technology and Civilisation (FSTC), was the guest of Newcastle University where he delivered a lecture on ‘'Muslim Heritage and the Cultural Roots of Science'. The lecture was attended by a large public audience and was followed by a discussion. We present hereafter a short abstract outlining the main topics covered by the lecture. Figure 1: Left to right: Professor Salim T S Al-Hassani (Chairman of FSTC and Chief Editor of "1001 Inventions" book), Turkish President Abdullah Gull (holding a copy of the "1001 Inventions" book), and Professor Talip Alp (Key Associate Member of FSTC). Human civilisation is an accumulation of contributions made by our global ancestors. However, these are not always remembered despite their immense impact on today's society. FSTC created a new space using roots and routes of inventions academically and innovatively, through edutainment techniques, to inspire future generations to respect one another and to contribute positively to society. Figure 2: Left to right: Turkish Prime Minister Recep Tayyip Erdogan and Professor Salim Al-Hassani. 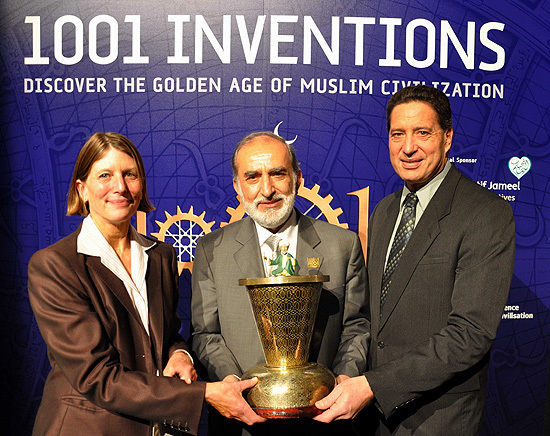 The global 1001 Inventions initiative (http://www.1001inventions.com) was examined as an extraordinarily successful example of engaging the public and promoting social cohesion and inter-cultural appreciation. In 2010 alone, the exhibition toured the London Science Museum, Istanbul and the New York Hall of Science, receiving over 800,000 visitors. Figure 3: Left to right: Professor Salim Al-Hassani and Lord William Waldegrave (Chairman of the Science Museum, London) handing over a model of Al-Jazari's-12th century Scribe Clock to Minister Kerem Kiratli (of the Turkish Republic) as a symbolic handover of the "1001 Inventions" exhibition from London to the City of Istanbul. The lecture was attended by a large public audience estimated at 150 people. The presentation included movies and a PowerPoint presentation on the importance of filling the 1000 years amnesia in the text books of science and technology used in schools and during the early years of undergraduate courses. A stimulating discussion opened after the lecture revealing a great interest in this topic and many questions were debated concerning the reasons for the rise and fall of Muslim civilisation. Further comments included praise of the 1001 Inventions global initiative and suggestions for it to either tour the UK or have a permanent venue for it here. . There was also a book signing session organised by Waterstones. 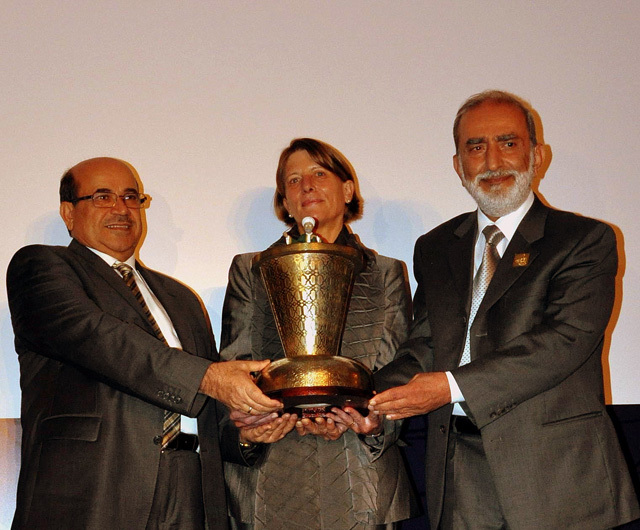 Figure 4: Left to right: Professor Bekir Karliga, Advisor to the Turkish Prime Minister, Dr Margaret Honey, CEO and President of The New York Hall of Science, and Professor Salim Al-Hassani, completing the symbolic handover of the exhibition from Istanbul to New York. Salim T S Al-Hassani is an Emeritus Professor of Mechanical Engineering and an Honorary Professorial Fellow at the School of Languages, Linguistics and Cultures at the University of Manchester. In 1999 he founded the Foundation for Science, Technology and Civilisation which uses the cultural roots of science to promote social cohesion and inter-cultural appreciation, through initiatives including the 1001 Inventions book, film and exhibition. He has authored and edited hundreds of publications and given numerous national and international talks on science and technology in Muslim heritage. He is an Honorary Fellow of the British Science Association, a Fellow of the Institute of Energy and in November 2010 he was presented with the New York Hall of Science's Global Award for Science. Figure 5: Dr Margaret Honey (The CEO and President of NYSCI) and Professor Salim Al-Hassani present the Scribe Clock to Jeffrey Rudolph (President and CEO of the California Science Center).